With the increasing amount of pressure to make tax digital and the future changes that will be implemented by the Government and HMRC, the profession of bookkeeping has never been more important and a perfect time to train in this prestigious field. The role of the bookkeeper has become an essential part of all successful businesses, ensuring that financial transactions are dealt with accurately and efficiently. With the introduction of technology, streamlining accounts will be a vital importance in providing the information required to comply with the future Government changes, and to help the business owner review and evaluate how their business is running. The basic system of manual double entry bookkeeping was invented more than five hundred years ago by a Cistercian monk called Luca Pacioli. His bookkeeping system still survives today and is still used throughout the world. Although technology and accounting software programmes are increasingly becoming more user friendly, the need for a professional bookkeeper has become more apparent. Expertise is required in order to monitor and maintain that the accounting records are processed correctly to a high standard, to provide the business owner with more time to concentrate on the business. At Premier Training we go the extra mile to make sure that as a student, you have all the material, resources and support that is available to you throughout your studies. You will receive all course materials the next working day (if enrolled before 2.30pm) and online material available within the hour. 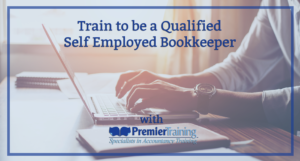 Studying this course will enable you to gain the valuable qualifications and key skills to be able to set yourself up as a self-employed bookkeeper. 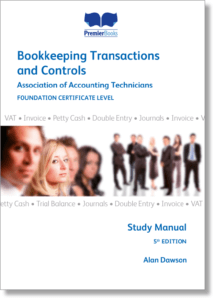 You will study all aspects of Bookkeeping up to trial balance. This will be both manual and computerised. Your special bundle will include all course materials, full tutor support and our Premier Programme. You might have considered what may happen when your bookkeeping business takes off. Why not take the next step and become an AAT Licensed Accountant. You may work towards this by enrolling on the Professional Diploma in Accounting. Q: How do I gain work experience in order to start my business? A: Why not try volunteering or contacting local Accountants asking if they would be willing to help you gain work experience. Q: What do I need to set up my business? A: You need to register with HMRC as self employed, register for MLR supervision, register under the Data Protection, have indemnity insurance with a minimum value of £50,000. AATQB status (AAT associate bookkeeping membership) is a new professional designation for employees in bookkeeping roles. It indicates the highest standards of professional conduct, up to date technical knowledge and commitment to ongoing learning. It’s becoming increasingly important for businesses to employ staff with professional status. AAT is a full member of IFAC, the global organisation for the accountancy profession. AATQB status demonstrates that you are undergoing CPD, signed-up to AAT’s Code of Professional Ethics, and are subject to our disciplinary processes. Our Code of Professional Ethics involves following five fundamental principles: integrity, objectivity, professional competence and due care, confidentiality, and professional behaviour. With AAT associate bookkeeping membership you are investing in your career and demonstrating the highest standards and best practice in bookkeeping. When you are looking for a promotion, professional AATQB status is a visible mark of quality, competence and commitment. It also instils confidence in colleagues and clients. AAT Bookkeepers can go on to study AAT Accounting Qualifications and apply for MAAT status (become an AAT full member). MAAT status offers a fast track route to chartered status with all of the UK’s chartered accountancy bodies. The AAT Foundation Certificate in Bookkeeping is a short qualification to help students develop essential bookkeeping skills. Once completed, they will have developed an understanding of basic accounting practices and techniques including double-entry bookkeeping. Depending on your abilities, previous work experience and qualifications and your work and family commitments it can take 2 to 3 months to complete this course. Two units are assessed individually in end-of-unit assessments by computer based test at an AAT approved assessment centre. You will receive your results within 24 hours. 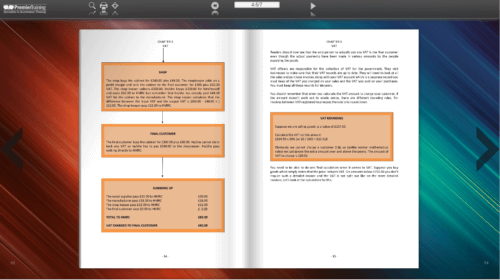 The Foundation Award in Accounting Software is a short qualification with one unit. Developed as a stand-alone nationally recognised qualification, the Award in Accounting Software is perfect for those who need to get to grips with accounting software and enhance their current knowledge, allowing them to use such software in the work environment. One unit is assessed individually in end-of-unit assessment by computer based test at an AAT approved assessment centre. You will receive your results in 6 weeks. The purpose of the AAT Advanced Certificate in Bookkeeping is to ensure that students have the advanced bookkeeping skills necessary to work in a bookkeeping role or to progress to higher level accountancy. Students will gain the knowledge and skills needed to carry out advanced bookkeeping transactions and tasks in three mandatory units. Three units are assessed individually in end-of-unit assessments by computer based test at an AAT approved assessment centre. You will receive your results within 24 hours. 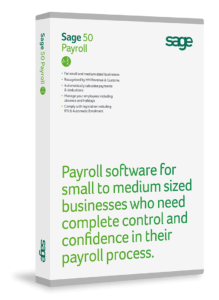 Sage 50 Payroll Certification is the only accredited performance-based certification program approved by Sage, the UK’s largest provider of payroll software. 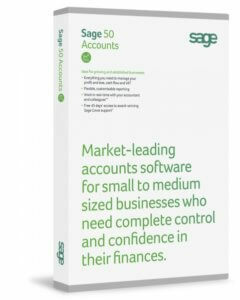 This course broadens your experience of Sage 50 Payroll. You will concentrate on statutory elements that you will need to deal with in your business, learn how to process the payroll year end and import and export your payroll data. Once you have done this you will receive an email from Sage explaining how to take your exam. It will depend on the qualifications and/or work experience you have already gained. If you have good numeracy skills and existing business/administrative knowledge you will be able to join the course directly at the Foundation Certificate Level. 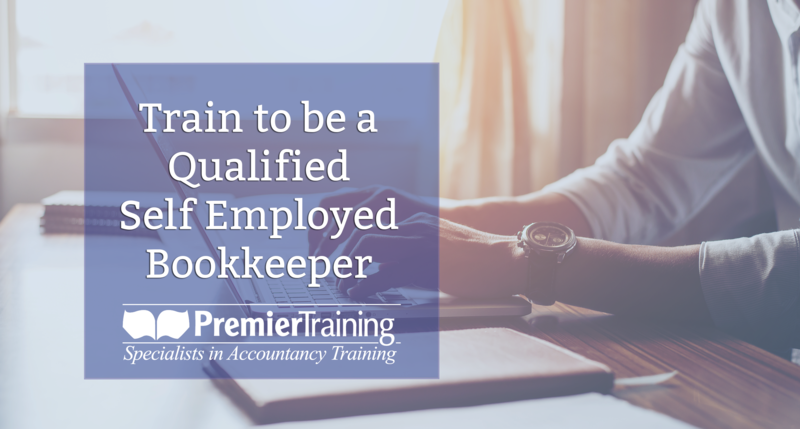 If you also have work experience or qualifications within manual bookkeeping there may be an option to start at the Advanced Certificate Level. To assess which level you can start at, you will be required to either provide current (qualifications that are completed within the last three years) and relevant qualifications. You can email them to info@premiertraining.co.uk and our assessors will advise if you are eligible for any exemptions. If you have bookkeeping/accounting work experience you will be required to complete a short online initial assessment that on completion is marked by an assessor. We will then contact you with the results and help you to make an informed decision. E-Learning videos in which our tutors cover key topics visually to aid our students learning and development. Our assignments are skills based, allowing you to put into practice what you have learned in theory. They cover the course topics extensively to ensure students are fully prepared for the AAT assessments. 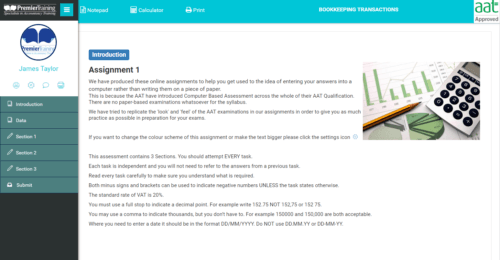 Each assignment will cover a few chapters of your study book to allow you to recap and test your knowledge of each section. 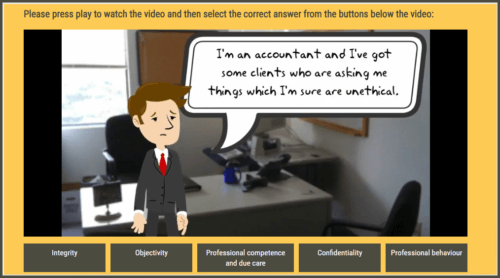 Our practice assessments are designed to prepare students for their live AAT assessment. They are based closely on the actual assessment so that students are fully prepared and aware of what will be expected. We want to help you to get started on your studies without the burden of excessive course fees that some providers charge. 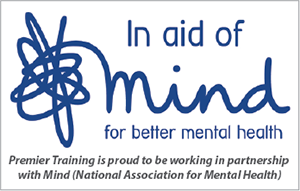 Award winning support, training and study resources should not cost you the earth, which is why we have kept our course fees very competitive to help on your journey to success. Gold Package: Consists of the Foundation Certificate in Bookkeeping and Advanced Certificate in Bookkeeping courses. The course fees can be paid up to 8 monthly instalments (interest free) and can include your AAT Subscription fee of £43. In addition to the Premier Training course fees you will be required to pay a student subscription fee to the AAT and assessment fees to the AAT Approved Assessment Centre (AAC). .
Assessment fees are payable to the assessment centre as and when you book each assessment. The fees will vary depending on the centre and consist of the AAT Assessment fee and Assessment Centre Administration fee. A fee is payable for every individual unit assessment. On successful completion of each course you will receive your certificate directly from the AAT. 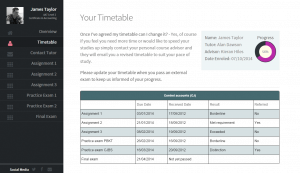 The Sage Payroll certificate will be provided independently. How and where do I sit an assessment? There are AAT approved assessment centres across the UK. The AAT have a search facility on their website that you will find in your MyAAT account. Log in to your personal online MyAAT and search for your nearest assessment centre. 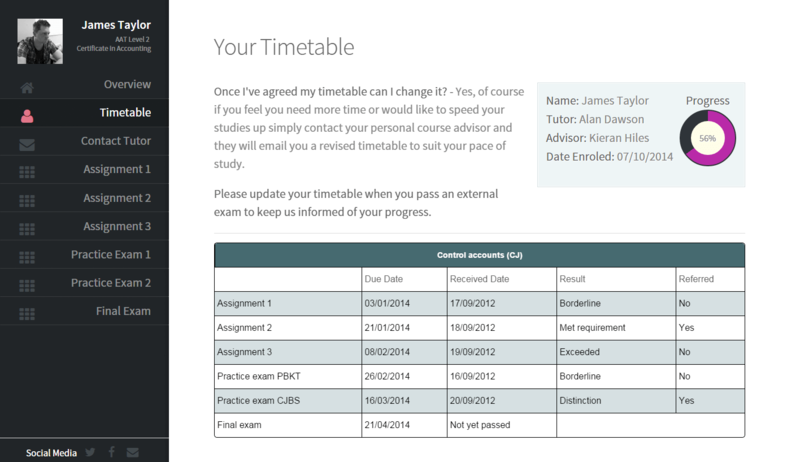 Simply contact your chosen assessment centre and book your assessment on a date that is available. You will be required to pay the assessment fee directly to the assessment centre. 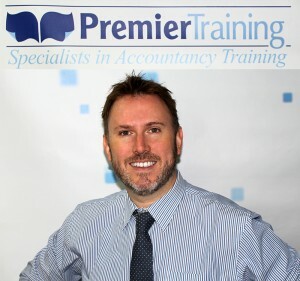 There are several ways to enrol with Premier Training on your chosen AAT course. Simply choose the way that is most convenient to you. Remember our late nights are Monday, Tuesday, Wednesday and Thursdays, till 8.00pm. If you enrol Monday to Friday before 2.30pm you will receive all your course material the very next day (including Saturday!). Online: To enrol online just click on the link below and the link will take you to where you can complete an online enrolment form and pay securely using a credit or debit card, via our secure server.